This book offers fresh, accessible insights and exercises that are nothing short of game changing for actors and everyone. This is what Connie de Veer came to me with. She wanted to write a book, a textbook for seniors, grad students and first decade actors, to help them fight discouragement. And she wanted to write it for teachers, who want to give young actors personal resources like resilience and confidence and good habits like craftsmanship and generous collaboration. So where does Jan come in? She wanted the book to have exercises. Ah, you’ve come to the right place. Do I ever have have exercises…. 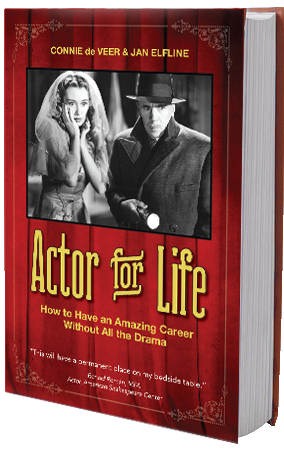 Actor for Life: How to have an amazing career without all the drama is the result of our collaboration. It is not the only result; it’s not even the most important one. I can count many hours of laughter, numerous learning curves, and a steady reminder of the beauty and complexity of the written word. So, the Book. Connie interviewed people who are still active in theatre professions decades after formal training. She wanted to know about their choices, attitudes, and strategies. Eight working actors and two casting directors told us how they have been able to work, even though a career in the theatre can be a minefield of opportunities for self-doubt, fear, and insecurity. We looked at the skills these people have developed, things like resilience, motivation, and courage. Take one acting professor: Connie de Veer. Add artist, teacher, coach Jan Elfline. Build on a shared vocabulary of coaching and self-leadership. Utilize neuroscience that has revealed how our brains tend to work. Include age old wisdom in a 21st century world. Enhance with mental exercises and thought experiments. Now that it is done, it speaks to working actors, acting teachers, and students of acting just as we had hoped it would. What we hear from others is that it is just as relevant for non-actors. These readers are people who act in their lives, and want to have amazing careers, and preferably without all the drama! “All the world’s a stage,” after all. See events and more details about the book on my co-author Connie de Veer’s website.